Claimed to be the first integrated active clamp flyback (ACF) controller, the SZ1101 has been released by Silanna Semiconductor for high power density AC/DC power adapters. The Flyback PWM controller integrates an advanced ACF controller and three ultra-high-voltage components, an active clamp driver, an active clamp FET and a start-up voltage regulator. According to Silanna Semiconductor, this level of integration reduces the bill of material in designing efficient, high power density adapters for mobile phones, tablets, notebooks and video game consoles. As energy and fast charging needs of mobile devices change, designers strive to deliver increasing amounts of power in a travel adapter while also keeping it cool to the touch and maintaining a small size convenient for consumers. High efficiency, or reducing power loss, is key to achieving the power density without overheating the adapter’s case. For example, delivering 30W today without increasing the volume beyond the 2.4 cubic-inch adapter that delivered only 15W a few years ago requires a minimum of 93.2 per cent efficiency to ensure that the case stays below -50 degrees C when operating at room temperature. The SZ1101 delivers over 93 per cent efficiency at 9V/3A with an all-silicon design, and over 15W/in3 power density at 30W, using an industry standard silicon MOSFET main switch. The integrated ACF circuit of the SZ1101 overcomes the traditional complexities of designing with ACF controllers, says Silanna Semiconductor. It does not require a tight tolerance for the clamp capacitor and leakage inductance, and Silanna’s proprietary OptiModeTM advanced adaptive digital control controls the on/off timing of the active clamp FET based on system operating conditions. 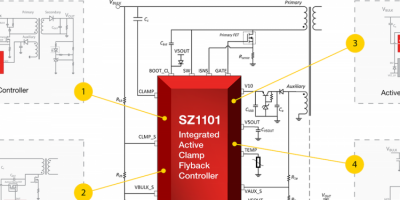 In essence, using an SZ1101-based power supply delivers designers the benefits of an ACF controller with the design simplicity of a traditional flyback controller. An SZ1101-based power supply replaces the conventional RCD snubber with a clamp capacitor and an integrated active clamp MOSFET for loss-less recycling of leakage energy to the output. Proprietary techniques in the SZ1101 control the active clamp circuit to achieve near zero voltage switching (ZVS) to improve efficiency. Additional proprietary techniques ensure optimal valley mode switching, tight switching frequency control and intelligent switching frequency handling to enable higher efficiency, reduce main switch voltage rating and appreciable attenuation of common-mode EMI noise. The level of integration of the SZ1101 reduces the bill of materials and allows designers to use a lower cost transformer, SR FET, clamp capacitor and input filter compared to conventional ACF or flyback-controller-based designs. SZ1101-based AC/DC power supplies easily meet the stringent DoE and CoC efficiency and no-load standby power requirements.